Instead of protesting against the war, Marilyn Sjaastad created a project to get people to demonstrate for peace. Using drums and other precussion instruments, peace activists in 15 cities made noise on behalf of peace. 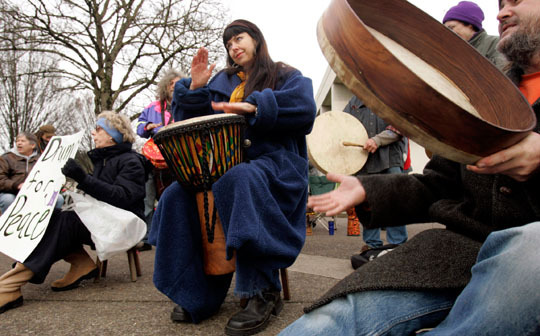 Pounding bongos and shaking cans to keep warm in the finger-numbing weather, a small group of Eugene activists gathered downtown Saturday morning to help drum up a little world peace. Supportive honks from passing motorists added to the beat made by about 25 people who gathered in front of the old federal courthouse at East Seventh Avenue and Pearl Street, taking part in Drums Across America. Organized by a Eugene resident as a simultaneous, 15-city drumming session, the peace percussionists hoped that drummers nationwide could help change the world’s energy in favor of harmony. The drumming began at 11 a.m. Pacific time, with drum circles from an assortment of cities – including Tulsa, Okla., Queens, N.Y., Huntsville, Ala., and Miami – adding their beats. The percussion built to a fast and furious pace, then a steady thump, culminating in a joyous cry at 11:30 a.m., when the drumming ended. Many of the drummers, including Wild Bill and his bongo, are regulars at a weekly Sunday drum circle that meets at the old courthouse. Sjaastad said the idea for Drums Across America came to her in September when she was trying to think of a meaningful project to do for a class called “Self Expression and Leadership,” at Landmark Education in Portland. She immediately began e-mailing and calling peace and drum groups around the nation. For Ronda Bagley, who stood toward the back of the crowd with her two daughters, all shaking homemade noisemakers, it was a chance to participate in a distinctly Eugene phenomenon. Organizers in Kalamazoo, Mich., pulled their city’s drummers together in about a week, Kalamazoo peace activist Raelyn Joyce said. 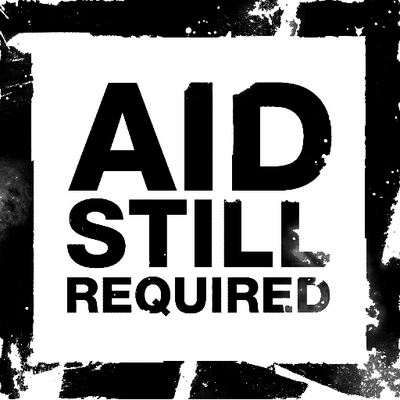 After receiving a call “out of the blue” from Sjaastad, Joyce worked with a local drummer to spread the word. At least 50 people of all ages and races filled a performance space in downtown Kalamazoo, drumming for an hour, Joyce said.